She was Cap’s main squeeze in Captain America: The First Avenger, and a fine job she did with it too. But it looks like we won’t be seeing Hayley Atwell back on the big screen as Peggy Carter in Captain America: The Winter Soldier. No big surprises here, though. 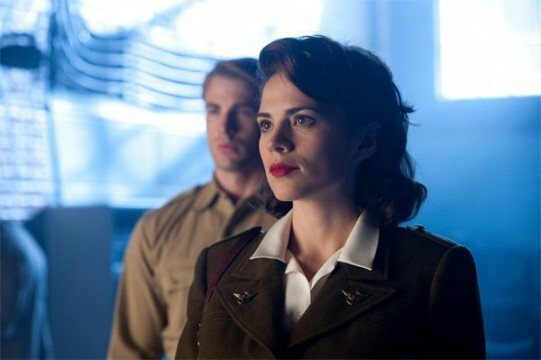 With the action being moved into the present day, it was unlikely that there’d be any reason for Atwell to reprise her role as Peggy Carter. If that character appears at all, she’ll likely be played by an older actress. There was always the chance that Atwell could play Peggy’s niece Sharon Carter, who becomes Captain America’s love interest, but that one has been put to rest too. Other actresses have tested/are testing for the sequel, including Emilia Clarke, Jessica Brown Findlay, Teresa Palmer, Imogen Poots, and Alison Brie, but no definitive casting choices have yet been made. It seems that Atwell is perfectly fine doing her work for the BBC adaptations, but I’m a bit disappointed, if not surprised. She was one of the many good things about Captain America: The First Avenger, and it’s a shame that we won’t get any more of the chemistry between her and Chris Evans. Those who are hoping for a reunion scene between the characters need not despair yet, however. There’s nothing to say that Peggy won’t see Cap again; she’ll just be a good bit older. Captain America: The Winter Soldier, directed by Anthony and Joe Russo, starts shooting in March 2013, with a projected April 14, 2014 release date.